This Greeting Card is available in multiple designs. Multicolor Offset printed card. Can be customized for a special price. Paid users- can view complete design. 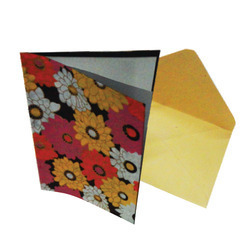 This is a one fold type thank you card has a single fold from the center. The front design has stylish border and thank you written in the center. The wordings of the thank you are mentioned on the inside of the fold. The envelope is plain and matching of the card. Match your Thank you card & Envelope with your main invitation. Borders , Material , colors can be matched.